Andres Iniesta confirms departure from Barcelona at the end of this season – Royal Times of Nigeria. Andres Iniesta has confirmed that he will leave Barcelona at the end of the season ending a career-long association with the LaLiga giants. 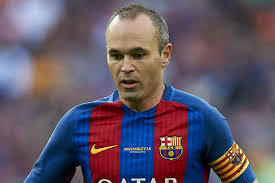 It could be recalled that Iniesta signed a lifetime contract with Barca last October but speculation has mounted over recent weeks regarding the 33-year-old midfielder’s future and a mooted move to the Chinese Super League. At a media conference on Friday at the club’s training centre, he tearfully told an audience featuring his Barcelona team-mates of his pending departure official saying , “This is my last season here,”. He said, “I have thought my decision through for a long time. For me, Barca is the best club in the world this club has given me everything. It’s a very difficult day for me, to be here saying goodbye when I’ve spent my whole life here at Barcelona. A great deal of who I am, is down to Barca and La Masia I am very thankful to them”. Iniesta did not reveal who his next club will be, although he is widely expected to seal a move to CSL outfit Chongqing Lifan. Since making his debut in a Champions League match against Club Brugge as an 18-year-old in October 2002, Iniesta has clocked up 669 appearances across all competitions for Barca scoring 57 goals. Iniesta also inspired Spain’s golden generation to glory at Euro 2008 and Euro 2012. He was named player of the tournament after a man-of-the-match showing in the later 4-0 final thrashing of Italy.